It’s been over a month since we’ve been exploring a new cloud venue with our SaaS products. One of the exiting changes that we couldn’t help noticing is how frequently we get to update our products with new features. I’m sure this is one of the sweetest things our customers continue enjoying in the cloud thanks to absolutely zero effort product upgrade. Indeed, all new features appear instantly next time you launch your favorite browser. No annoying compatibility issues, no lengthy software assurance testing before rolling out to production, no manual reconfiguration – it’s all been taken care of for you! Field picker. Now you’re free to choose a set of event fields being displayed in your search results. If you haven’t dealt with the event logs much and all you need to know is “who did what” in your environment then just stick with the default selection of W5 fields (Who, What, Where, When, Where From). If you mastered Windows Security log and feel a need to see events as they originally appear in the event log then just pull native event fields into the view: EventId, Source, Category, User, Computer, etc. Whatever event fields you choose they all participate in any searches you run. New reports. 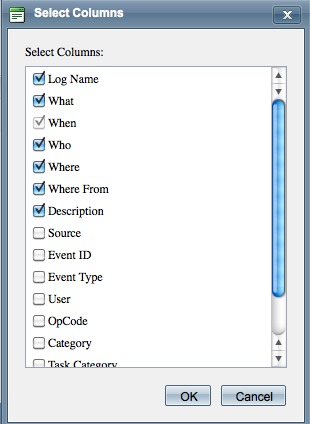 You can find a wider selection of pre-defined reports on Security Log events. Moreover, happy customers of Quest Change Auditor can take full advantage of the event log management in the cloud which now includes support for Change Auditor product logs and reports. Faster event processing. Some tweaks were made to the event queue processing components living in the cloud. Optimizations made to event metadata processing algorithm resulted in significant performance gain and warranted better service scalability in the long run. These are just the most notable changes recently made to the product. The list goes on with numerous fixes and optimizations of the service being constantly made. And all this is provided for free with your existing service subscription. There is more to come soon. It’s been two weeks since we officially launched our first three Software as a Service solutions. At Microsoft TechEd 2010 in New Orleans Quest Software announced general availability of Recovery for Active Directory, Log Management and Site Administrator Reports that jointly established a new SaaS products family named Quest OnDemand. From that day on everybody can go to http://www.quest.com/ondemand and give a free try to all three. It just asks you to sign in using your LiveId credentials (if you don’t have one you can sign up for it right away), provide some basic customer information and off you go to the world of elastic, secure and dollar efficient cloud computing. I’m sure that there are a lot of challenges to take on as we continue this SaaS journey. I feel very excited about what we’ve achieved so far and even more excited about what’s to be done in the nearest future. Stay tuned for new product feature announcements and demos, architectural reviews and relevant news. I’m sure they will be coming out much more often now. Sign up to the OnDemand community site and post your question or share your thoughts with other users. And I’m telling you – your feedback will make into the actual product! One of the exciting projects I’ve been involved in at Quest is the whole SaaS initiative called Quest OnDemand in general and Event Log Management Service built on top of it and named InTrust OnDemand in particular. InTrust OnDemand was first announced at the PDC in the end of 2009. Now the service is in the limited beta and applications can be submitted through www.quest.com/ondemand. Dmitry Sotnikov did an excellent job white boarding the OnDemand framework architecture and performing a live demo of it. Inspired by his demo and videos like this I thought it would make sense to record a 5 minute walkthrough of InTrust OnDemand that would give an idea what the service is to those of you awaiting the beta application being approved. Here is what I came up with after endless attempts to narrate a good enough voice without too much of the accent and background noise. Still leaves much to be desired but hopefully hits the goal. You be the judge. I’m very excited yet a little bit confused to start my professional blog. The main idea of the blog is to explode and develop my areas of interest to which I include Software as a Service (SaaS), Security Information Event Management (SIEM), Information Security and Systems Management in general. Today I’m a Senior Program Manager at Quest Software, smart systems management company. My job lets me stay on the edge of new technologies and explore what hides behind such buzz words as Cloud Computing became these days. I hope you’ll be hearing a lot from me on this topic later on. I hope that someone who will happen to read this blog will find the content useful. After all I don’t find it worthwhile to write for the sake of writing. So, your feedback and comments are greatly appreciated.